If necessary, you can specify a backup window for the backup job. 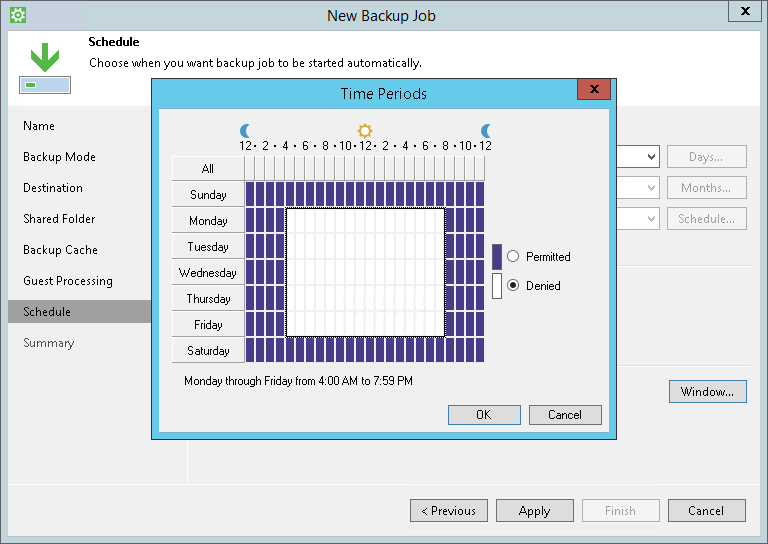 The backup window is a period of time on week days when the job is permitted to run. If the job exceeds the allowed window, Veeam Agent for Microsoft Windows will automatically terminate it. The backup window can be helpful if you do not want the data protection job to produce unwanted overhead for the production environment or do not want the job to overlap production hours. In this case, you can define the time interval during which the job must not run. The backup window affects only the data transport process. Transform operations can be performed on the target location outside the backup window. The backup window does not affect the process of uploading backup files from the backup cache to the target storage. If Veeam Agent for Microsoft Windows has created one or more backup files in the backup cache, and then the backup target becomes available, Veeam Agent for Microsoft Windows will upload backup files to the target location immediately, regardless of the specified backup window. If you define the backup window for the job that runs periodically at specific time intervals, Veeam Agent for Microsoft Windows will immediately start the job after the denied window is over. All subsequent backup job sessions will be performed according to specified scheduling settings. The first job session will start at 12:15 AM (since midnight is a reference time for periodically run jobs). The next job session will start at 4:15 AM. The job session at 8:15 AM will not be performed as it falls into the denied period of the backup window. The next job session will start immediately after the denied period is over: at 7:15 PM. After that, Veeam Agent for Microsoft Windows will run the job by the defined schedule: at 8:15 PM, 12:15 AM and so on.